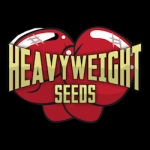 Heavyweight Seeds were originally founded in Spain in 2008. Using only highly stable pure strains, the Heavyweight team set about producing a mouthwatering selection of varieties, a range with a variety to satisfy all tastes. Only released onto the European market in 2010, Heavyweight is already building a name for consistency and quality time and time again. With an expert team dedicated to ongoing research and development, the Heavyweight ethos is simple – their driving passion is to produce top quality genetics and they won\'t stop at nothing on their quest for excellence! For top quality and knockout results, look no further than Heavyweight!